Two Sundays ago with Milan amply below freezing and me fighting a stubborn virus and in need of an excuse to leave the house, I ended up at the Affordable Art Fair. There are trade fairs for cosmetics, farm vehicles, cellular technology, airplanes, outdoor sports, wine, food. You name it and it probably has a trade fair. And, as it turns out, contemporary art is no exception. The Affordable Art Fair bills itself as “the leading showcase for affordable contemporary art.”Affordable is, of course, a somewhat relative term. 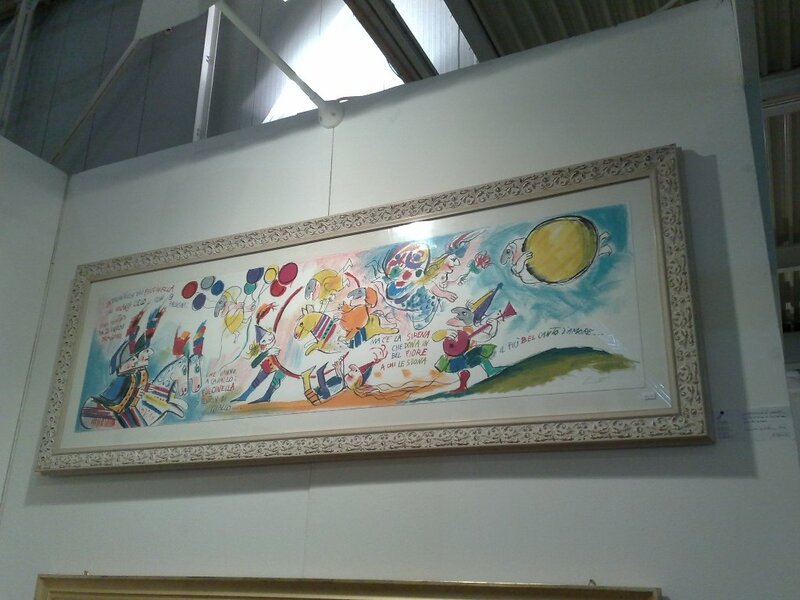 Here they put the cutoff at 5,000 euros, above that and the exhibitors (i.e. galleries) are not allowed to sell it. So I’ve been to my share of trade fairs both for work and pleasure and they are all pretty much the same. You walk up and down the aisles looking at the newest gadgets (hoping for a cool freebie), touching the tractors, tasting the wine. The Affordable Art Fair is no different and in a large space in Milan’s trendy Via Tortona neighborhood set up with white dividing walls you cruise the aisles looking at contemporary art, all of it on sale and all of it for less than 5,000 euros. I was just looking for a Sunday afternoon diversion and ended up going home with a print by Emanuele Luzzati, an artist and set designer from Genova known for his vibrant colors and wonderful imagination. Luzzati died in 2007, here’s a look at his life and legacy thanks to The Guardian. Can I ask you how much you paid for your Emanuele Luzzati? I have a signed poster from the 1993 Spoleto Festival and love it but was curious how precious his art is.